At Old Warden, it's the machines that matter. And that, unquestionably, is why this charming venue remains, by some margin, the finest place to watch an air display in the UK. Dan O'Hagan reports for UK Airshow Review. It was while listening to a fascinating talk on flying the Avro Triplane by Shuttleworth Collection pilot Chris Huckstep that the penny dropped. He was speaking about how the Shuttleworth policy has, for many years now, been to not display their machines aerobatically. No looping, no rolling, even though a good number of the aircraft are more than capable. 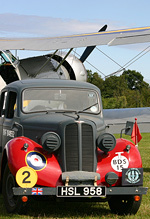 Instead the ethos is about displaying the aircraft as close to the crowd as possible. In types where it is deemed safe, that means coming down to just fifty feet. Farnborough this is not. How often do we read complaints about the "boom and zoom" type of warbird displays, where the pilot clearly is having a whale of a time, while the paying customer is left admiring (or cursing) a speck up in the clouds, and waits an age as the pilot repositions for the next blink-and-you've-missed high-speed dive and pull-up. At Old Warden, the machines are kept close to the crowd for longer - engines aren't run flat-out, and the displays are far more intimate as a result. Old Warden just "get" what display flying is all about. The ego of the pilot (and let's not forget the majority on the Collection roster are drawn from test pilot ranks, so the very best of the very best!) takes a back seat to showing off the lines of the machine. This is the polar opposite to, for example, the ludicrous circus which followed The Horsemen around last summer, where to the outside observer it seemed that the pilots were to be lauded as more important than their mounts. 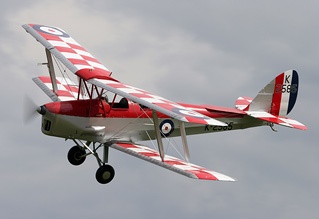 Sure at Shuttleworth we don't see, for example, the Hurricane or Gladiator thrown around to the extent of identical machines at other venues, but does anyone complain, or see these displays as inferior? No, never. The crowd at this show, as usual, was richly rewarded. Low, elegant, graceful, "topside" arcing passes. At times the aeroplanes at this show seemed so close you could reach out and touch them. 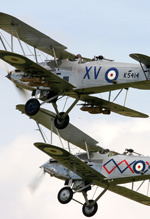 The marvellous Hawker Demon and Hind biplanes, the aforementioned 'Glad and Hurricane. 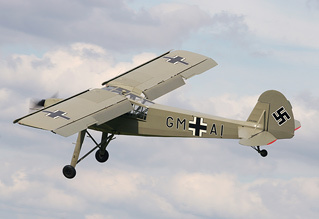 Westland's ungainly Lysander, the lanky Fiesler Storch. The closeness of the displays entertains and engages. Small wonder that many of the crowd at Shuttleworth events take in multiple shows at the venue each season. The place, and what it stands for, amid the modern, moribund airshow scene of grey jets, distant display lines, sky-rocketing ticket prices and abysmal military support, is truly addictive. Old Warden does get criticism for repetition, though nonetheless, this show featured some true gems - the stunning Travel Air Mystery Ship was a new machine for me, and flown with the home-based Percival Mew Gull offered an excellent snap-shot in time, harking back to the golden age of air racing. Even the normally tame Battle of Britain Memorial Flight seemed intoxicated by the Shuttleworth Spirit, their IX and PR.XIX Spitfires performing as a pair, bending around the trademark dog-leg together, though, if anything, rather too close to the crowdline! Cancellations (which an otherwise excellent commentary failed to bring to the crowd's attention) included the Hawker Hunter, Avro 504, Bristol M1c, and not for the first time, The Fighter Collection's Hawker Nimrod, which was, apparently, kept from leaving Duxford because of cross-winds. Even without them, this was a fine way to spend a sunny Sunday afternoon - at a venue which simply has no equal.